Key to the lunarium facing the lake on the second floor of Byrgenwerth College. In his final years, Master Willem was fond of the lookout, and the rocking chair that he kept there for meditation. In the end, it is said, he left his secret with the lake. 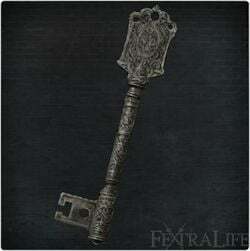 Lunarium Key is an Key Item in Bloodborne. Unlocks the Lunarium in Byrgenwerth College. From the Lunarium you can access Master Willem, the Moonside Lake and Rom, the Vacuous Spider. On a counter, up a ladder near the top of Byrgenwerth College. There is a bug in Bloodborne version 1.01 and below that can prevent this key from spawning if the player has used the Small Resonant Bell or Sinister Resonant Bell items in the Forbidden Woods. Update to v1.02 to prevent this bug from occurring. This item&apos;s description bothers me lore-wise... It speaks of Wilhelm as if he was dead !! 1) "In his final years, Master Willem was fond of the lookout"
2) "In the end, it is said, he left his secret with the lake"
I found this key. It was there. I know it was. I picked it up, then went right to the door it goes in. To the balcony place. I know what this key is for. It&apos;s to the balcony where you go to fight rom. The spider man. Na Na Na Na Na Na Na Na spider man. I was able to find this key at the listed location and so was my brother. The key is not there for my friend and he cannot progress. Glitch? So its says that try not to play multiplayer in the forbidden woods. But what about the area right after, Byrgenworth? Would the summoned still be affected?